In a move to relieve traffic pressure and environment pollution, Hanoi is considering banning motorbikes entirely by 2030, as well as other measures like fee collection in rush hours and stricter regulations on app-based ride hailing services. Authorities are seeking public opinions on a resolution under development named ‘Enhanced management of vehicles and reduction of pollution in 2017-2020 period, with a vision towards 2030,’ which will be submitted to the municipal People’s Council for consideration soon. Per the resolution, in 2017-2020, the city will take stock of all motorbikes and develop an emissions standard which will be used to remove outdated bikes that fall short of environmental standards. In 2025-2029, the city will pilot banning motorbikes in certain hours and days, on some streets or in the urban centres, moving towards a total ban in 2030, with electric bikes not exempt from the ban. Simultaneously, the city will develop public transportation, which includes long-term plans like urban rail system, bus rapid transit system and other buses. According to Ngo Anh Tu, Director of the Science Research and Training Centre under the municipal Department of Transport, one of the parties developing the resolution, the ban on motorbikes will be imposed in urban districts, regardless of whether the bikes are from outside or inside the city. The ban will “surely have impacts on people’s ways of life,” so public opinions are still being sought, he said. A synchronised network will be put in place to ensure that every citizen can access public transport in a 500m radius from where they live or work, the draft resolution reads. Aviation economics professor Luong Hoai Nam, a frequent commenter on social issues, is a fervent proponent of the motorbike ban. According to Nam, the 12 to 13-year roadmap towards 2030 should provide ‘ample time’ for the city to develop its public transport system, which will help cut the need for private vehicles. Also, the period is long enough to settle problems arising from the ban, including career change support for people whose livelihood depends entirely on motorbikes and mass purchasing of outdated motorbikes, he added. However, Nam rejected the authority’s choice for public transport. He said previously, the city ‘wrongly’ put high expectations on mass rapid transit (MRT) — urban public transit system using underground or elevated trains — since the system’s coverage is limited and will not be able to meet the demands of millions of people deprived of vehicles. The primary mode of public transport, Nam said, should be buses, developed in tandem with mini buses, tramlines, traditional taxis, increasingly popular third-party ride-hailing services like Uber and Grab, school buses and employee shuttle buses. Each of the components in this network will support and complement each other, lessening the dependency on private vehicles. “The money that would go into developing 10km of MRT should be reserved for buying 10,000 buses – both the conventional and the mini version, that is much more practical,” Nam said. “Many cities in China have already banned motorbikes while forgoing a MRT system, as has Myanmar’s capital Yangon,” he added. Regarding the group most likely to be harmed by a ban, small-scale vendors, Nam opined that transportation of goods using motorbikes would gradually have to move to mini trucks. Agricultural produce from rural areas or other provinces must be brought to wholesale markets and delivered throughout the city via trucks. On the other side of the debate, Professor Nguyen Xuan Thuy, former Director of Transportation Publisher, told Thanh Nien (Young People) newspaper that traffic in Vietnam’s cities should not be blamed on motorbikes alone. In Hanoi, public transportation can only handle 8-10 percent of public demand and at the current rate of development, in 13 years, the rate will only reach about 20-22 per cent. “When motorbikes are banned, what will 80 percent of the population do?” Thuy asked. Thuy also mentioned Yangon, saying that when city authorities decided to ban motorbikes in 2003, the city quickly became flooded with old cars, while pollution and traffic congestion remained problems. “To curb congestion, limits must be enforced on both motorbikes and cars,” he said, adding these measures can only be done when public transportation meets 30-40 percent of demand. 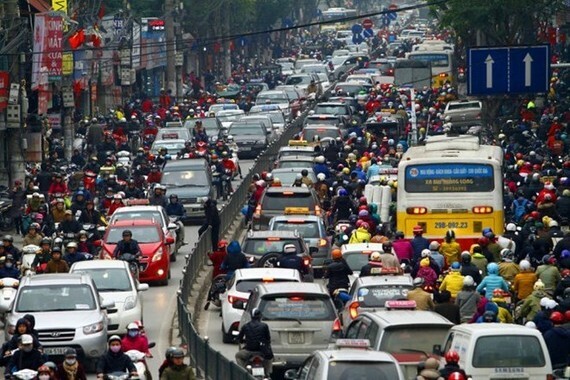 Hanoi is considering ways to alleviate traffic jams during rush hours by restricting car access to certain streets, implementing odd-even hour vehicle ban schemes, or more drastically, a city-wide adjustment of work and school hours. Economic measures are also on the table, including fee collection in rush hours, progressive rates for street parking (the longer a car is parked, the higher the hourly fee is), especially in downtown areas. According to the draft legislation, Hanoi will not resort to administrative measures to curb the increase in cars. However, a quota scheme will be used for taxis – both traditional ones and new services like Uber and Grab – calculated based on current traffic infrastructure and capacity. 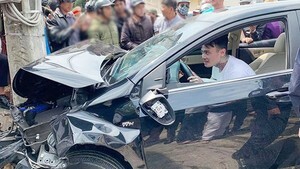 Nguyen Van Thanh, Chairman of the Vietnam Automobile Transportation Assocation, said the original aim of Uber or Grab was to put ‘leisure’ cars or motorbikes in use, under a sharing economy model. However, the number of these app-based taxis has risen dramatically, with ride-hailing taxis estimated to double the number of traditional ones, in addition, many people bought cars to join the industry. Thanh expressed his scepticism at quotas, saying that a quota scheme might lead to more corruption, since there will likely be under-the-table transactions for higher quotas. “When the conventional and app-based ride-hailing services have their clashes, the market will decide which should prevail, when the number of taxis reaches a saturation point, taxi drivers will have to adjust,” Thanh said.